Please complete your registration and confirm your camp information. I have been informed that pictures or videos of my child participating in the soccer camp could be featured in Utah Elite Soccer advertisements, social media posts, website photos, etc. I understand that this is a requirement for participation. ​I hereby authorize Utah Elite Soccer LLC staff to act on my behalf, in accordance with his or her best judgement, in case of an emergency involving me/or my child, and agree to assume full responsibility for all expenses, medical or otherwise, that may arise as a result of injury or accident sustained while participating in Utah Elite Soccer LLC activities. I understand that I, or my insurance company, will be billed for such emergency treatment. I understand that I must fill out a liability waiver form and PAR-Q (health screening) form before my child may participate in Utah Elite Soccer LLC activities. These forms can be found below. It is strongly recommended that these forms are filled out prior to the event because in some cases a child may need to obtain a physicians release before participation. Please fill out the following forms and bring them to the first day of training. They are required for participation. You may also email signed digital copies to coachtomaz@utahelitesoccer.org. of Risk,and ​Emergency Contact form. 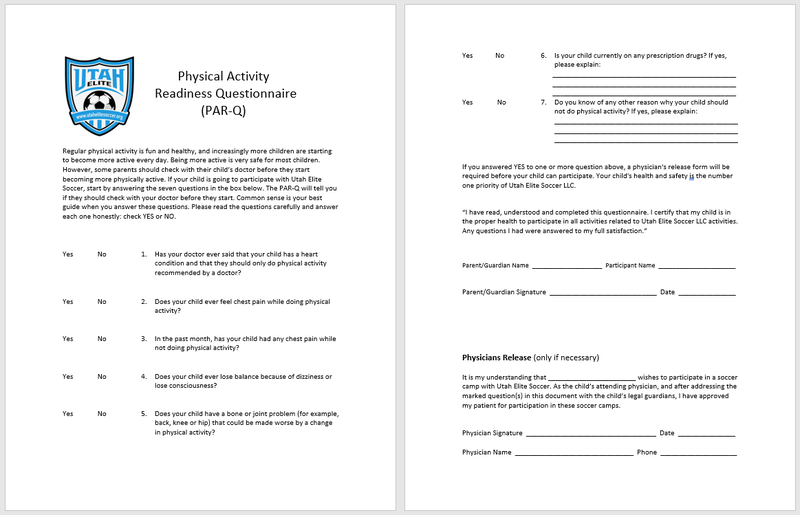 The PAR-Q form is a health screening form used to determine if your child is healthy enough to participate in physical activity.